Transit (moving) Saturn is a slower moving planet, spending about 2 1/2 years in each sign. The aspects it makes to your natal planets last for 2 weeks up to 2 months, and in the houses, Saturn can remain for over 2 years. Transit Saturn shows where you have work to do, where you can evolve and mature, where you can dedicate yourself, and where you can experience blocks/delays. When transit Saturn is in your 3rd house, your optimism is tempered. Reality sets in, and you seem more serious and thoughtful. You may be prone to worry and bouts of anxiety. If you’re predisposed, you can suffer depression or other mental illness during this aspect, but only if you haven’t been doing the proper work to get to the core issue that causes it in the first place. You try to streamline your daily life, cutting out anything that seems wasteful, and become more productive. The way in which you communicate may change, and you become more effective in how you communicate to the world. You could be more quiet as you do that. You may experience issues in your community, with your neighbors, with a sibling, or with technology. If in school, you can go one way or the other, struggling or flourishing. When transit Saturn is in your 4th house, you work on strengthening your home base, your family, and your inner foundation. You could clean up your home, remodel, or move, though none of those things will likely go smoothly and some blocks/delays occur. You can focus on issues with your family and try to work through them to strengthen the ties you have with them. You may decide to cut ties with a family member, recognizing that the relationship can’t be saved. You can take on more responsibility with your family, trying to help them as best as you can. You may feel like you’re too restricted in your life as this transit begins, and have to deal with whatever issues are causing that restriction. This is a good time to tackle your inner foundation and try to make it stronger, more solid, and something durable that will sustain you for some time. 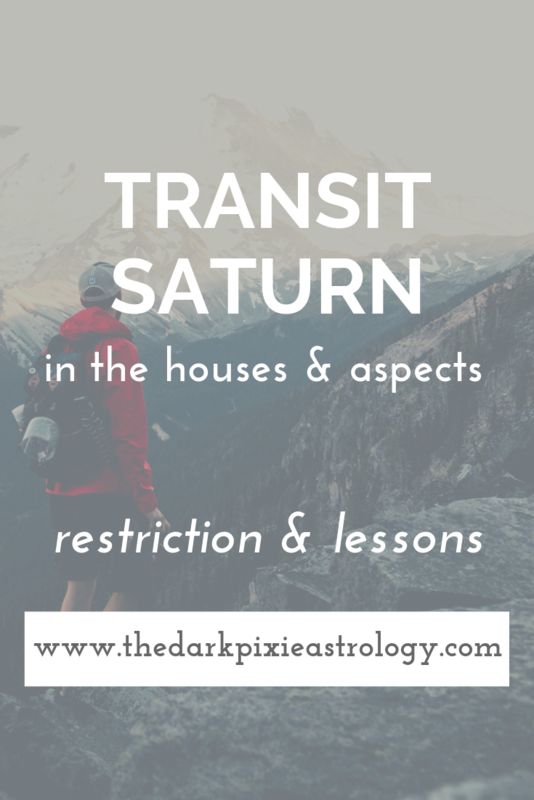 When transit Saturn is in your 5th house, your sense of fun may be drained temporarily. You don’t feel up for parties, socializing, romance, your hobbies, or anything that can be construed as fun for you. You’re more serious, and carefully consider what gives you joy in life and why. You have to look at what your own talents are and be honest with yourself about them. Don’t deny what you’re good at and let it waste away. For creative types, you may feel uninspired as this transit begins, going through a creative block, and have to find inspiration within yourself. In romance, you may feel like you have less love in your life, and have to learn to feel worthy of love because you’re a good person and not because of what other people think of you. Self-love is something that you may need to cultivate. When transit Saturn is in your 6th house, you can analyze your daily life, your routine, and see how you can do better. This transit gives you the opportunity to become more productive, efficient, and clear out the stuff that is clogging up your daily life. You can bring more structure and order to your life, get better organized, work out better work schedules, and improve your health. You may experience a health issue during this transit, usually as it begins, and this forces you to confront your health and change your lifestyle. You have to be more responsible when it comes to your health, and this transit makes you learn that. When it comes to work, you may take on more responsibility, or feel stress from too much pressure. It’s likely not as bad as you think it is, but you need to learn to manage your time better and how to focus your energy. When transit Saturn is in your 9th house, you may question your faith and beliefs. You look at how they’ve been impacting your life and whether they make any sense anymore. You could abandon your faith temporarily, and feel less optimistic than usual at the start of this transit. You have to understand what inspires you and what your true beliefs are. You need to work on blocks with your confidence levels as well, and how you stand in your own way. If in school, you could have some difficulties at first, wondering if you’re studying the right thing, but for many, this is a good time to learn, and older folks may go back to school or begin studying something new that takes them in a different direction. You can experience delays or blocks with travel, or have issues with the law. When transit Saturn is in your 10th house, you focus on building a strong foundation for career success. The 10th house rules your career, and you want to work hard at making career advancement and experience success. You assess the success you’ve had up until this point, and focus on the failures that you’ve endured. If you’ve been working hard and smart, this transit can bring plenty of rewards for your work. If you haven’t been, you’ll face the consequences of your actions. You want to know where you are in your life currently, and how the world views you. You may not like how vulnerable you feel around other people. You can take on more responsibility and be more mature, but it can be a burden. This is a transit that can go either way, being an extremely successful period in your life where you make great strides, or one full of pressure and problems. It all depends on what you’ve done up until this point, and whether you’ve been living properly or not. When transit Saturn is in your 12th house, you experience a serious, heavy period of time where you have to clean out your life carefully. You need to let go of baggage and of the things that hold you back. It’s not easy to face your issues, but you have to. The things that you hide from yourself, that you deny are there, are the things that will likely require your attention the most. You can’t run, escape, hide, or deny any longer. Continue to do so, and you’ll face consequences. Fear will grow, and you’ll develop more unhealthy, destructive habits. There’s so much we carry with us that we don’t need over time, and this transit gives us the chance to get rid of that. It’s daunting and it takes time, but it’s rewarding. This isn’t usually a good time to begin anything new, but rather is a time of endings. Be introspective and face your subconscious. This is a good time to start therapy. By the end of this transit, you should have much less weight on your shoulders, and when Saturn moves into your 1st house, you’re ready to hit the ground running. With transit Saturn conjunct your natal Sun, whatever you’ve been doing in your life, you’ll now see the results. If you’ve been working hard and smart, you’ll be rewarded for that. If you haven’t been, you’ll be punished. Be honest with yourself about the work that you’re doing in your life, and whether or not you’re making the best decisions possible for your life. You can experience issues with your body, especially as a result of stress. This is a good time for beginning new projects or paths in your life that are long-term, and to act more responsibly. With transit Saturn sextile or trine your natal Sun, your life is more stable and there usually doesn’t seem to be as much upheaval. You feel good in your own skin, and are aware of exactly what you know you can and can’t do. This makes it a good time for working on projects, and you can be more confident. You may be more serious, responsible, and realistic. The sextile or trine tends to be very quiet in their influence with Saturn to the Sun. With transit Saturn square or opposite your natal Sun, challenges, blockages, and various issues tend to present themselves, especially if you haven’t been making good decisions. Often, you’ll have problems come up, and they’re meant to show you areas of your life that you’ve been neglecting or mistreating. It can be a good time to live more minimally, and scale back on the things you don’t really need, as well as behave more responsibly and maturely. Harsh Saturn aspects are a challenge, especially to the Sun, but they offer the most opportunity for growth if you work with them. With transit Saturn conjunct your natal Moon, you need to evaluate your life and whether or not your emotional needs are being met. If you feel alone and without help, this transit can make that apparent to you, and you must try to remedy the problem. Looking within can be helpful, though it may also be unsettling if you let it be. Confront your issues and try to resolve them. You could feel like you have a lot more responsibility, and some may try to avoid it, but that’s not the right thing to do. This time can be difficult emotionally if you don’t try to use it positively and just run. If you deal with the energy, you can develop greater strength and awareness of reality. With transit Saturn sextile or trine your natal Moon, you’re not as emotionally in conflict with what must get done. You can handle your responsibilities well, and deal with whatever comes at you. Your emotions are less likely to rule over logic, making this a good time for decision-making. You can feel more like a real mature adult. With transit Saturn square or opposite your natal Moon, your emotions are likely to be on the downside, and chances are, you’ll be more pessimistic than usual. Watch for depression, especially if you’re prone to going that route anyway. You may emotionally react to situations in a way that isn’t worth it, making them worse in your head than they really are. Loneliness can set in, and problems with the home, mother, and women are likely. It’s hard for you to deal with life right now, and you’re definitely not up for trying new things or doing anything risky. This transit brings extreme caution and insecurity. Just let things go at their own pace and try not to speed everything up or let yourself get too down. Allow yourself to recharge and assess what’s important to you, and if a change in your routine is needed, implement it with care. With transit Saturn conjunct your natal Venus, all of the issues that you have in relationships become quite obvious to you now. You may distance yourself from people so you can clear your head and try to deal with these issues. You can be more afraid of rejection and less willing to take risks in love. You’re more realistic about relationships and what it takes to make things work. If you’ve been in denial about a partner or loved one, you won’t be anymore. You can become more committed. You can also deal with your finances. With transit Saturn sextile or trine your natal Venus, you can be more responsible financially and in your relationships. You take these matters more seriously, and can commit yourself to someone romantically, or to a new financial plan. You see these matters more realistically as well. You have an easier time dealing with people older than yourself, parents, bosses, and mentors. You can take the things you enjoy and make them into something profitable. With transit Saturn square or opposite your natal Venus, you may feel more isolated. If that happens, you need to assess how you’re treating other people in relationships, and whether or not you’re pushing people away. You’re much more realistic, but you can also be pessimistic regarding love. This is a time for you to forge stronger ties with your loved ones, and release those that don’t really matter. With transit Saturn conjunct your natal Mars, you have to restrain yourself to a degree. You could be faced with problems if you become too aggressive or frustrated. Calm yourself down and try to go about your business in a civilized manner. You’ll have to mature during this period, and figure out more productive ways to deal with anger. With transit Saturn sextile or trine your natal Mars, you can control your energy much more easily than usual. You have self-discipline and can work hard for what you want without wasting any time or energy. You’re more mature and practical, which allows you to be productive. You’re aware of what you’re physical capabilities are, and can make improvements to your body. With transit Saturn square or opposite your natal Mars, something stands in the way of you getting what you want. You try to push against it, but that only makes it worse. You’re not as excited about what you’re doing, and take a more practical approach. You can’t go overboard now, needing to learn to slow down and get control over your energy and drive. With transit Saturn conjunct your natal Jupiter, you don’t feel as optimistic as usual, and are forced to be realistic about life and the situations that you’re in. It can feel restricting, binding, and you may try to fight against it, but that won’t work out very well. You need to work as hard as you can and try to make sound decisions. If you can do that, you can make great strides. With transit Saturn sextile or trine your natal Jupiter, you’re extremely productive and get a lot done. It’s not forced on you, and you want to work. When you do, you can accomplish more and experience less resistance along the way. You’re practical in your approach, but believe in your abilities. With transit Saturn square or opposite your natal Jupiter, you don’t feel that things are going to work out, and you don’t think there’s a point to trying. Then you experience all sorts of problems and you feel like life is piling on. You may not be able to get things done in a timely manner, and have to put in more work than you want to. You have to work hard to fight against the restrictive nature of these aspects. With transit Saturn conjunct your natal Saturn, you experience your Saturn return, when Saturn returns to the exact placement it was at when you were born. Your first Saturn return, which usually occurs between 28 and 32, is seen as a marker for entering adulthood. For some, it’s a trying time where they experience problems related to issues that Saturn wants them to overcome in order to mature and grow. For those who have already done the work pre-return, this can be a time of reward. Most are the former though. Each subsequent Saturn return you experience is supposed to be easier and more rewarding, as long as you don’t stubbornly refuse to learn any lessons. With transit Saturn sextile or trine your natal Saturn, you can be more productive than usual and get a lot done. You’re efficient, hard-working, and dedicated to what you should do as opposed to what you want to do. With transit Saturn square or opposite your natal Saturn, you’re unhappy with any restrictions that you may be feeling in your life. Until now, you may have just ignored them, but now, you can’t miss the glare. Any restriction you feel, you’ll turn on and try to fix, usually by enacting some sort of big change, but it may not go as well as you think. With transit Saturn conjunct your natal Uranus, you become keenly aware of the restrictions in your life, and you want to break out of them immediately, or let them get you down. You need to take a risk but do so in an orderly fashion. Plan for it, and prepare yourself for what will come. With transit Saturn sextile or trine your natal Uranus, you can implement changes in your life in a practical way that won’t completely capsize the boat. You want to take advantage of the energy, otherwise it may pass without much going on. With transit Saturn square or opposite your natal Uranus, you can be pulled in two directions, wanting things to remain as they are but hating the restrictions, or wanting things to completely change but terrified of doing so. Try to merge the two and make changes slowly and with careful consideration. With transit Saturn conjunct your natal Pluto, you can focus your will and determination to accomplish great things, but you have to control yourself, especially your anger. Any anger that you may be hiding can come out and create problems for you. If you see this aspect coming, try not to hold in so much so you don’t explode. With transit Saturn sextile or trine your natal Pluto, you can be productive and get a lot done. Your focus is good, you know exactly what you have to do, and you have discipline and restraint. With transit Saturn square or opposite your natal Pluto, you may find yourself surrounded by people who have bad intentions, and need to protect yourself. Any issues with people that you’ve been bottling up won’t want to be bottled any longer. You may struggle for power or control, and be manipulative or manipulated. Try to focus on something productive.